Anil Gandhi stands next to a Tulsi shrine at his nursery, Vedic Gardens. When South Asian immigrants to this country get homesick, there’s a good chance they can probably locate an Indian restaurant or grocery store to remind them of home. Finding a place that stocks the plants and trees they grew up with is much harder. One entrepreneurial immigrant in Morrisville is seeking to change that. Anil Gandhi moved to North Carolina from Mumbai back in 1989, lured by family members and good jobs in the telecom industry. But today he makes a living by selling the plants of his native India. As a sprinkler shoots water over hundreds of exotic-looking items at his nursery, Gandhi strolls over to a small shrine with a leafy herb called Tulsi spilling over the top. "In India, most of the Hindus family, they have this in their backyard. The ladies they come in the morning and they bring the holy water and they take a circle and they pray to the goddess Tulsi, " says Gandhi. The Tulsi plant- also known as holy basil- is one of the most popular items for sale at Gandhi’s business, called Vedic Gardens. He opened it three years ago near the Raleigh-Durham airport, after realizing there was a demand in the South Asian community for greenery from back home. "Now it’s come to a point where it’s getting so popular that every single day I have customers calling from out of state asking me to ship plants, whether it’s a bodhi tree, or holy basil or a curry leaf plant, which is another popular one." As far as Gandhi knows, his business is the only plant nursery in the country catering to South Asians. He has a steady stream of customers every day, some of whom drive in from neighboring states. 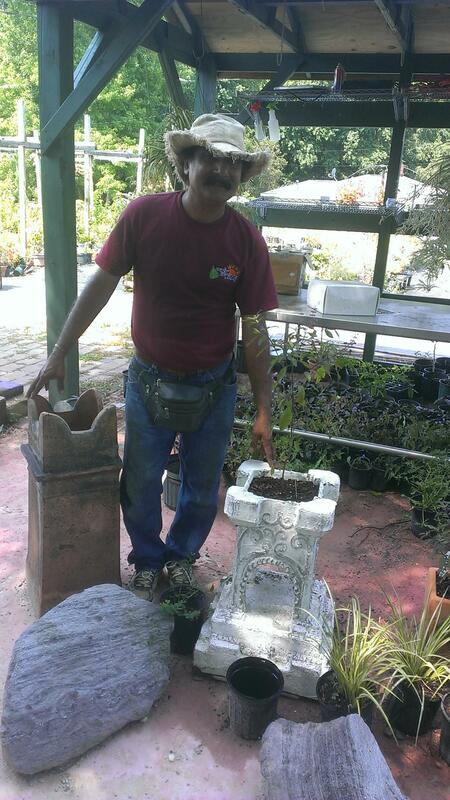 Gandhi got started in the landscaping business 12 years ago, after he was laid off from his telecom job. He had always loved gardening, so after much thought he decided to start his own landscaping business for the area’s growing South Asian community. "So I went to do the landscaping and they would ask can we put a mango tree in our yard, can we put a tamarind here, can we put a banana here, so that prompted me to research more deeper into plants," says Gandhi." That’s when Gandhi began collecting all the plants he needed from online stores and nurseries so South Asian customers could find everything they wanted in one place. Today, a customer can buy everything from spiky turmeric plants to several varieties of jasmine from India and the Middle East. These days, Gandhi propagates most of his products himself, with the help of seeds he finds on Ebay and in stores. And even though many of his plants are subtropical and need to be brought inside during the winter, he can’t always keep up with customer demand. On any given day at Vedic Gardens, you’ll find customers wandering through Gandhi’s collection of plants with smiles on their faces. A few years ago, Sudharsan Narva moved here from Connecticut, where he says he never found anything like this. Narva says there’s one thing he always notices every time he visits the nursery. "The smell first thing," says Narva. "I correlate myself with what I used to be long time ago when I was in India, the smell of the tree, the smell of the flowers. So it feels like home, that makes me really happy here." A few steps away, Sunita Prabu is examining a cluster of graceful curry leaf plants. They’ll eventually grow into small trees. Prabu says it’s important to have a good supply of fresh curry leaves for her Indian home cooking. "This one, if you take the leaves out of the tree fresh, it smells very good, rather than buying it from store, so we thought of like keeping one in our balcony so that we can get fresh leaves whenever we want to cook," says Prabu. Many of Gandhi’s employees were born and raised here in the U.S. and didn’t know much about Indian culture before. But they’re learning. According to recent census data, twenty percent of Morrisville’s population is originally from South Asia. Amanda Hayter is a native North Carolinian who’s watering a row of holy basil plants by hand. She says she’s happy to be part of this growing business. "It’s definitely working," says Hayter. "I mean you have to think about the area that you’re in and who you’re selling to and be definitely diverse and open to new things. If you don’t you’re just going to fail miserably." As for Anil Gandhi, as a boy growing up in Mumbai, he never could have imagined he’d end up running an Indian plant nursery in far-off North Carolina. Gandhi says emigrating to the U.S. opened up a whole new world of possibilities. "This is the country that gives you opportunity to do whatever you want to do. And that’s what I’ve learned. Just honesty and hard work can take you way up there, wherever you want to be," says Gandhi. Gandhi says in deciding to open the nursery, he stumbled across his dream job. He says there’s nothing better than growing the plants he loves and sharing them with others.